Following the success of Charlotte Hodes's exhibition at the Wallace Collection, London, in 2007, Marlborough Fine Art is delighted to be holding its first exhibition of Hodes's work. The exhibition will feature approximately 20 ornately decorated ceramics, a group of which are considerably larger and more ambitious than the ceramics displayed at the Wallace Collection. Complimenting the ceramics, and shown alongside, will be a series of intricately cut collages. The depiction of the female figure, drawn from contemporary and historical sources, is the over-riding and recurrent theme. 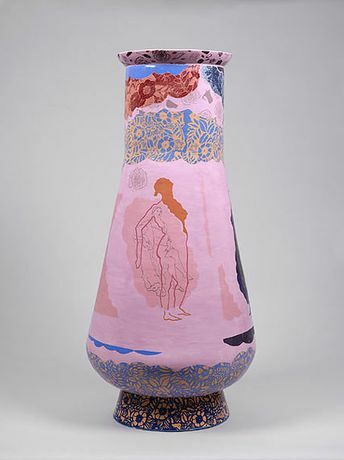 The figure set against a rich tapestry of pattern, drapery, repeated motifs and held together through intensely pulsating colours of pinks, purples and greens evoke a sensuousness and a sumptuous feeling of celebration, simultaneously questioning the position of the female figure as decorative motif.